Building backyard playgrounds and “forts” for kids is a common job for the hobbyist. Usually lumber is employed in this application; however, sometimes you want to go the extra mile. 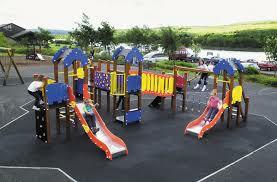 You may be surprised to learn that the same colorful playground plastic used in public and commercial playgrounds is available to the public. The product is called “Densetec Play” and is plastic sheeting for this express purpose. Densetec play is available in all the bright colors you’d expect but has additional hidden advantages as well. Designed for outdoor use, Densetec Play is fully UV-stable and will not be affected by rot, rust, or mold which will attack traditional materials used in this application. Densetec Play is easily fabricated using household power tools. It can be cut, drilled, sawed or routered with easy into endless complex shapes. The special “orange peel” surface texture helps the product be resistant to liquids, dirt, and grime allowing for easy cleanup. Densetec Play is available in 1/4″, 3/8″ and 1/2″ thicknesses. The average cost per 4′ x 8′ sheet would be $200-$350 USD depending on quantity. For more information on Densetec Play, contact the distributor Redwood Plastics and Rubber.